Can I change my Save the Date into an Invitation? 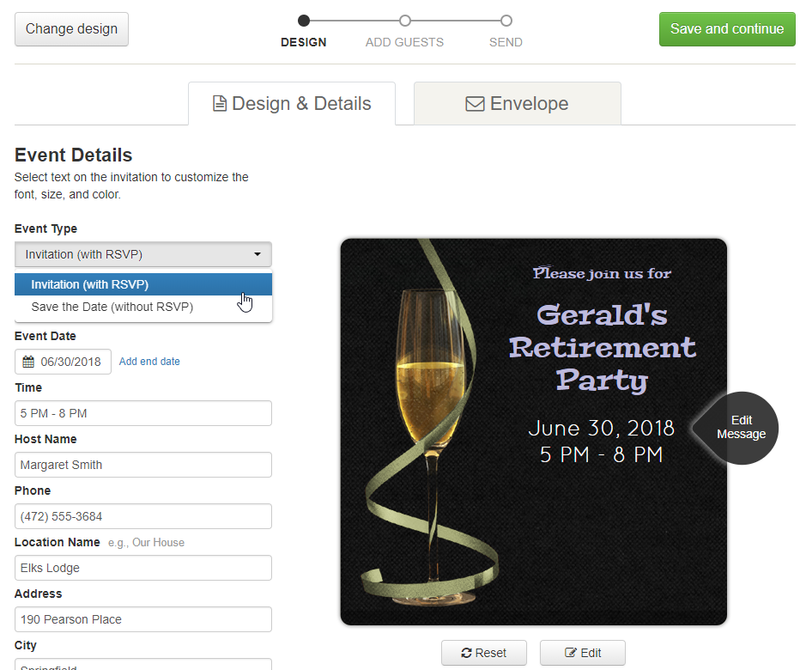 Once your Save the Date or Invitation has been sent, your event type cannot be changed. This helps avoid confusion for your guests who may have already viewed and responded. However, if you haven't sent the save the date out yet, you can change the event type. From the Design & Details page of your Save the Date, click on the Event Type menu. A drop-down menu will appear. Select Invitation (with RSVP). Make sure to click the green Save and continue button when you are ready to proceed with your invitation. If you've already sent the save the date out, you'll need to send a new invitation by selecting a new design from our Design Gallery. If you are inviting the same guests don't worry, we save all of your past guests in your Punchbowl Contacts for easy access. You can also use the Copy button next to the save the date on your dashboard to create an exact duplicate. After copying, you can keep the same information but change the new copy into a different event type. The Event Type menu is currently not available within the Punchbowl mobile app.